Gabions were a popular feature of many of the show gardens and exhibits at the 2004 Hampton Court Palace Flower Show. 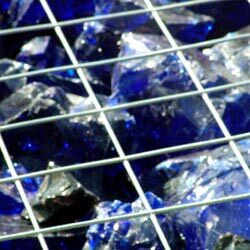 Gabions are cagelike structures filled with stones or rocks. They came in all shapes and sizes and are made of mesh or wire. I first encountered gabions in a first year geography lecture about coastal erosion processes. Geography is 95% common sense and 5% colour pencils and gabions are the same. Gabions are used to provide stability to the coastline, hillside or roadside and are a common western construction technique. They are common throughout New Zealand's roads and are constructed in situ by filling the metal cages with rocks, boulders and excavated material. Large Gabions scattered across a shale stream in the Waterside Garden. Gabions are also often the first step in land reclamation and have their uses combating water erosion - the spaces between rocks provide excellent drainage, and the cages prevent the aggregate material from washing away. 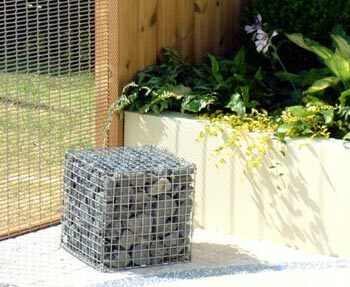 Gabions are more than just a protective or retaining measure, they have a place in gardens - particularly urban or inner city roof terrace gardens. In some gardens curved banks of gabions are replacing traditional brickwork and paving altogether. Gabions featured in a wide variety of Hampton show gardens from the wire mesh cubes of blue cut glass in WRAP's Recycled Garden to the giant basketball like gabions scattered across the Waterside Garden under the Water Garden Pavilion. Their use in many of the gardens at Hampton Court confirms their rise in popularity and gives them a Royal and Horticultural seal of approval. Garden centers and home improvement stores be warned, middle england will be wanting gabions in their gardens this summer.